This is a great inspiration for anyone who really loves calla lilies and wants to use them throughout their entire event!! These pictures are from one of our brides, Jennifer (Brennan) Thompson, who got married September 1, 2007. 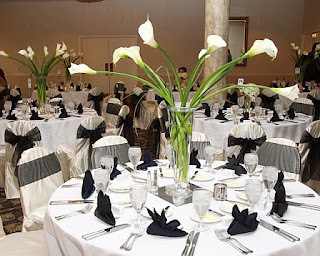 Jennifer really loves the look of calla lilies and wanted to really feature them in her wedding decor. Her bridesmaids carried mixed colored mini callas accented with loops of lily grass, which really gave a pop of color against their black dresses. Each groomsman wore a different brightly colored mini calla to match the bridesmaids. Jennifer’s bouquet was all white callas to give a contrast between her flowers and all the others at the ceremony. Then, for the reception, the elegance of the calla lily theme and the white in Jennifer’s bouquet was carried through into the centerpieces. Several large white calla lilies were placed in trumpet vases along with the dark green lily grass to give the arrangement even more of a contemporary feel. 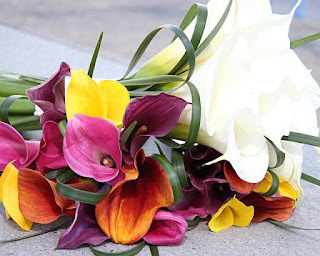 This made for a showy, but simple way to showcase the callas that were featured at the ceremony. This gave the entire event a consistent look. 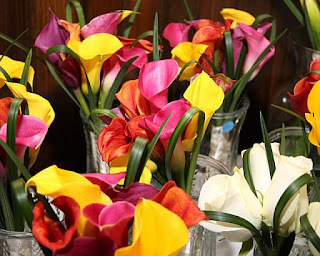 This is just one of many ways to use callas in weddings/events. Whether you use them exclusively or mixed with other flowers, calla lilies are a great way to add simple beauty to an event any time of the year. Special thanks to Jennifer Thompson for sharing her pictures with us!